Well, SOS has been out less than a month and was featured by Apple on the US App store! Yay! Well, launch day for Sunshine is drawing to a close for me. Still lots to do to try and promote my little game tomorrow, but it’s been a good day overall! Thank you to everyone that helped spread the word, and for all the kind words for Sunshine! It’s really appreciated! As the icing on the cake, this review came in late last night, and is rather wonderful! It’s by arcadelife.co.uk (and we always worry about disappointing them as they’re lovely and know their stuff!). Fortunately it’s a good review, with an incredible 91/100 on the scoreboard for Sunshine! I had to sit down and have a cup of tea to recover, believe me! Thanks to arcadelife, 148apps.com, theAppReviewer, Twitter and Facebook followers, people that left reviews and ratings on iTunes and everyone else that helped today! It’s been fun and knackering all at the same time! So that’s day 1… time for bed methinks! So, the game is out today on iPhone and iPad, and you can find more details on it here! I got a wonderful review of the iPad version from 148apps! It’s lovely! I’ve always liked the site – our previous games scored 3 stars (Gravitrixx) and 3.5 stars (Air Supply) from them. They’re hard to please, but they’re fair! But most importantly, they give someone like me the chance of a little exposure in the sea of Apps that are out there. And for that, above all else, I’m always very grateful! Hope you enjoy the review – it made me smile lots! 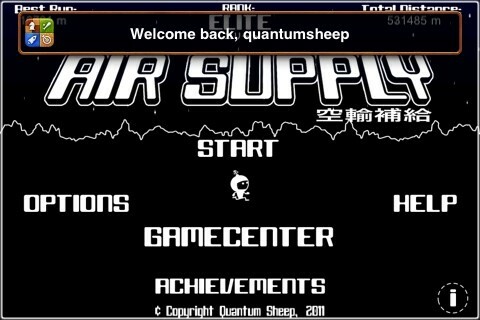 Business Insider made a very interesting and fun post called “The Best iPhone Games You’ve Never Played” – and Air Supply is featured! So if you’ve never played Air Supply, give it a go here! Also, I’ve just submitted an update to Apple with GameCentre leaderboards added. There’s one for each colour available in the game, as well as an overall highest score leaderboard for Air Supply and Fuel Supply modes! Hopefully it’ll go through ok! Looking forward to seeing everyone competing at last! Well, Air Supply has got a couple more reviews! It’s lovely that people take the time to not only play our games, but also write about them! I’d just like to also say thanks to everyone that left us a review on iTunes as well! It all helps, and it’s greatly appreciated! *Added an extra unlockable character to the game! *Added yet another awesome Mister Beep track, making seven (SEVEN!!!) in total! I love that vid. I mainly feel bad about the guy’s broken screen, but I love that he seems to be enjoying himself regardless, and you can even hear him humming along to the music! And there’s more actual gameplay footage here. I’m busy working on 1.2 at the moment – hopefully done by the weekend! Hope you’re all still enjoying the game! Lots more to come, Air Supply wise! Attack of the Kraken will be available for arm7 ‘i’devices from Thursday, August 12th, 2010. Look out for it on the app store!